Day: Wednesday, September 13, 2017 NOTE: this event has already happened, find current-year events on the events page. Speakers included: Alicia Cox, ED of Yellowstone-Teton Clean Cities; Natalie Meyer, Director of Sustainability for City of Bozeman; Carson Taylor, Mayor of Bozeman; Letter written by Governor Steve Bullock; Bill Clem, CEO Of Kerb Space. After the unveil of the new Kerb charging system, attendees ate free ice cream while checking out the EVs that were on display. 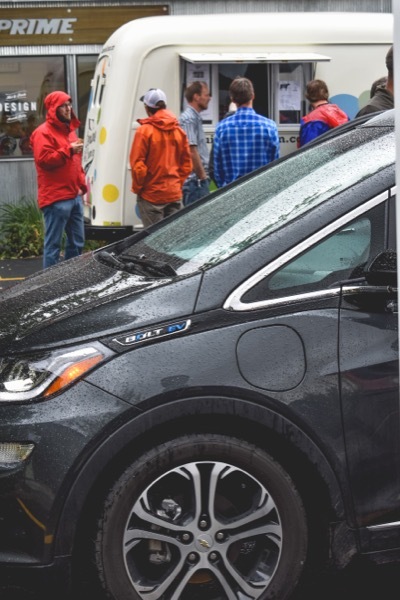 Brave attendees eat ice cream in the rain behind the Chevy Bolt that was on display. Come join us at 810 N Wallace for a EV charging station unveiling and EV car show! We will have the unveiling of the KERB EV charging system at 4:30 pm followed by our speakers (TBA) and the car show from 5-7pm. At 6 pm we will announce the winners and award their prizes. The Genuine Ice Cream truck will be serving up free scoops to the first 150 attendees as well as vending and include a special custom electric themed ice cream for the event! Presented by Electric Auto Association, Plug In America, and the Sierra Club, National Drive Electric Week, September 9-17, 2017, is a nationwide celebration to heighten awareness of today's widespread availability of plug-in vehicles and highlight the benefits of all-electric and plug-in hybrid-electric cars, trucks, motorcycles, and more. They are fun to drive, are less expensive and more convenient to fuel than gasoline vehicles, are better for the environment, promote local jobs, and reduce our dependence on foreign oil. Are you considering going electric? Come talk to owners who have successfully done so. There are currently 19 attendees registered. Registered attendees report 59,018 electric miles driven.